PLATE IV. GRIM'S CROSS, MICHAEL. 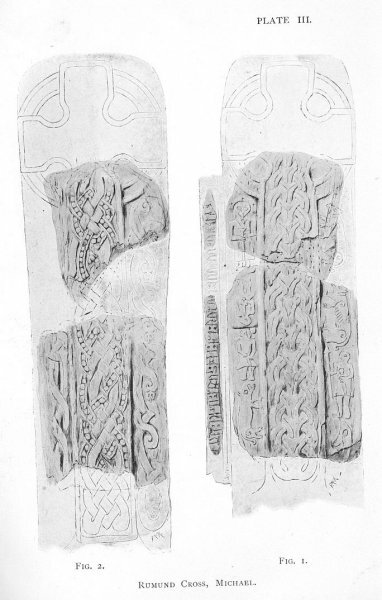 Two fragments of a cross at Michael (pl. III.) erected by Grim to Rumund (Hrómund), give us a view of Odin in Valhall, and of the sports and pastimes there of the champions, Einherja. 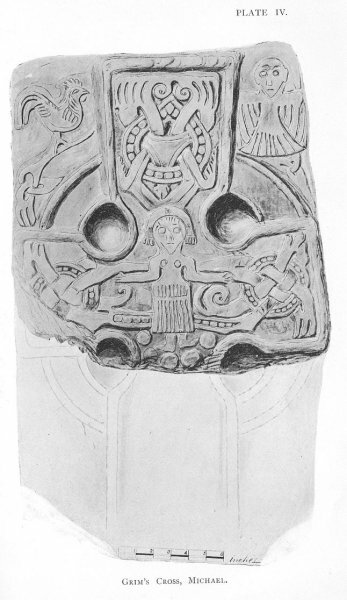 At the right of the shaft of the cross, on one face (fig. 1), is the figure of a man with a long spear in his right hand, his left on the hilt of a short, pointed sword, and clothed in a kirtle or tunic; he is bird-headed. Above is the figure of a Wolf, and the smaller fragment shows the forepaws of another similar figure above it. This is undoubtedly Odin with his spear Gungnir, accompanied by his wolves Geri and Freki. Below may be seen a large fish--the great Fish in the stream which runs through Valhalla. pleasures of the chase. The one, head down, has been slain, but will rise at even to banquet with his victor and the gods and fight again another day. But what is this figure immediately under the head of the cross? Long-robed, his hands clasping in front of him a crutch-headed or tau-shaped Staff, under his left arm a Book, around his head a Nimbus of peculiar design, with fringes, as in the case of the Christ on Grim's cross, Michael, and upon one of the Virgin Mary on Roolwer's cross, Maughold. Like these also it bears three small crosslets, reminding one of the nimbus in the Book of Kells. 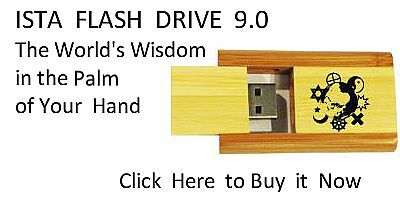 This, I think, is intended for Christ, and signifies that now He and not Odin is King of Heaven, the material joys of which are depicted at either side of the Tree of Life, Odin's steed, Christ's palfry!